Persicaria is commonly known as ‘knotweed’ and some species are garden worthy while others present some problems. A group of useful woodland plants that handle damp conditions, some species do have a tendency to roam can be an issue. Look for the less invasive species such as Persicaria affinis, Persicaria bistorta and Persicaria amplexicaulis. 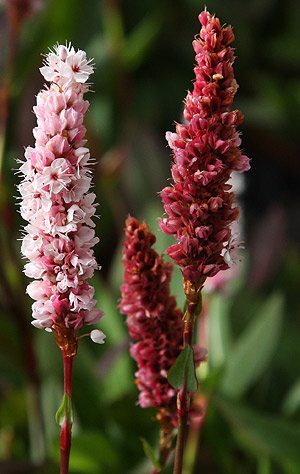 Species range from low growing ground covers Persicaria affinis to taller growing species such as Persica amplexicaulis which has a long flowering season and soft pink poker like flowers. For dry shade try Persicaria virginiana. P.affinis is the species of choice for the garden, with ‘Dimity’ and ‘Superba’ being two named varieties readily available. Low growing and matt forming it will spread, however is not seen as invasive. Flower spikes open a pastel pink before turing to a deep crimson in late summer. Grows well in full sun to part shade reaching around 30cm in height. P.odorata is known as Vietnamese ‘Hot Mint’ and is used in asian cooking. It is frost tender, and as it tends to make roots wherever the stems touch the ground needs to be grown in a container from which it can’t escape. In warmer climates this one is a perennial, in cooler areas it is an annual. Most nurseries simply say, best suited to containers, rather than ‘invasive plant’ in warmer climates.